We are regarded as one of the well-known Copper Carbonate Exporters in India. 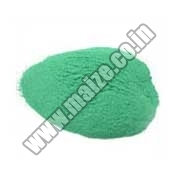 We offer a wide range of Copper Carbonate that is green in color and is available in different quantities as required. This Copper Carbonate chemical is without lumps and odorless, due to which it is used as poultry, cattle and animal feed.